Billboard Magazine Gospel Artist of the last decade Yolanda Adams is a 5 time Grammy Award winning Artist who believes that her music Heals, Encourages and inspires others to trust more than themselves. She has triumphantly carried the torch for contemporary gospel and inspirational music via 13 glorious albums. Stunningly beautiful, exceptionally educated, filled with the spirit and blessed with one of the most powerful voices in any genre of music, this Houston-native and one-time school teacher has been a stately beacon of God’s light. She has earned numerous accolades for her shining efforts, including the first American Music Award for Contemporary Gospel Artist and four Gospel Music Association Dove Awards. Her pioneering blend of modern gospel with R&B and infused with a touch of jazz continues to inspire her fans and transform the musical landscape. 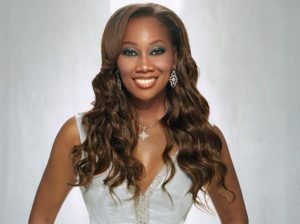 “The Yolanda Adams Morning Show,” a program of her creation and ownership, can currently be heard on radio stations across the country. Most of Yolanda’s fans know she was once a school teacher; less known is the fact that she earned her college degree in Radio/Television Broadcasting. Joined by her distinguished co-hosts the hilarious Marcus Wiley, Yolanda’s show is all about waking up in the sandbox every morning and having F-U-N! “We have a great morning show,” Yolanda says beaming. “It’s not a gospel show or an inspirational show, but a versatile overall morning show. I wanted to create a clean alternative morning show for people of faith. Faith, Love, Forgiveness, Protection and PRAISE. These are just five of the ten gifts explored in Yolanda Adams new power-filled inaugural book, Points of Power. Inspired by the Points of Power segment from The Morning Show, Adams reveals her own personal experiences to show how the Bible will enlighten readers and provide them with insight and understanding to respond positively to life’s challenges. “Points of Power” provides the tools, the wisdom and spiritual guidance for living a praise-filled, prayerful, and joyful life.